I’m hoping to set down a few words about every great Bob Dylan song as I make my way through this Long and Wasted Year. “Girl From the North Country”, the second song on Freewheelin’ Bob Dylan, is certainly one of those. A truly heartbreaking song, it has genuine emotional power. Not for nothing did they use it as the emotional centrepiece of Silver Linings Playbook (although they used the Nashville Skyline version – more on that in about six weeks when I’m allowed to listen to it). This is one of the Dylan songs where I don’t think he ever did a bad version of it. One couplet makes all the difference. 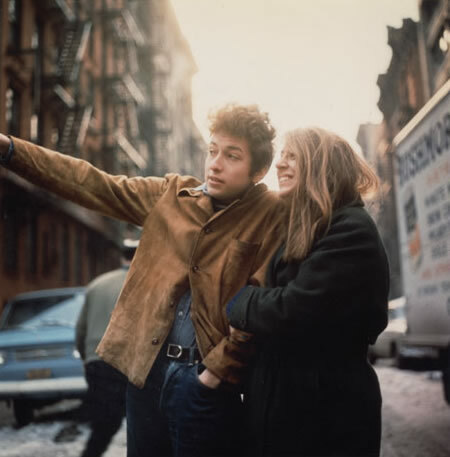 Despite what Nat Hentoff claims in the liner notes for Freewheelin’ Bob Dylan, the singer wrote A Hard Rain’s A-Gonna Fall in the summer of 1962 – well before the Cuban Missile Crisis erupted in October of that year. Indeed, Hentoff’s claim that the song is a reaction to that crisis is demonstrably false as Dylan performed it on stage for the first time on September 22, 1962. That performance, part of a hootenanny organized by Pete Seeger, is a fascinating one. Dylan performed all five verses of the song that runs over seven minutes (apparently each of the performers was given only ten minutes of stage time, something that he violated) with some slight variations to the lyrics as they were recorded and are regularly performed. Some of these may be simple errors that come from singing a lengthy song in public for the first time. Dylan says that he has climbed to the “top of six misty mountains” rather than to the “side of twelve”. In the third verse he regularly uses the verb “saw” rather than “heard”. In the final verse he sings “dark forest” rather than “black forest”. As I say, minor stuff. There are two big differences between the Carnegie Hall performance and the final version of the song. In the third verse, he adds a final line that eventually disappears: “I heard the sound of a one person who cried and was human”. It’s a nice line, but it doesn’t add a whole lot to the verse, and, indeed, seems slightly redundant. The line appears on the version of the song he recorded for the Witmark Demos, but it is gone from Freewheelin’. The more significant difference, and one that has a huge impact, is the change to the first two lines of every verse. Dylan asks in the first verse: “Oh where have you been, my blue-eyed boy? Oh, where have you been, my baby, my own?”. This is a striking alteration from the familiar version which rhymes “blue-eyed son” with “darling young one”. It’s jarring, not simply because it is unfamiliar, but because the elegance of the rhyming couplet is absent. 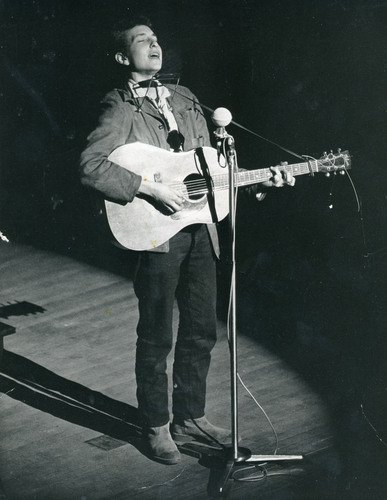 Dylan seems to have recognized this quickly, as it is only at Carnegie Hall that he seems to have sung it this way – by the time of the Witmark Demo recording it has reached the final version. The extra line and the change to “son” are interesting examples of Dylan editing his work, and you can see the song evolve over a number of recordings before it crystallizes. In the 1970s (and later) Dylan would begin to tamper dramatically with the structure of his songs (compare this version with the one from the Rolling Thunder tour show at the Montreal Forum that can be found on Bootleg Series 5, which is the most uptempo and fun apocalyptic vision of all time (well, except maybe REM. And Timbuk 3)). A Hard Rain is my favourite song from Freewheelin’. Unlike Blowin’ in the Wind, there is a lot that can be done with it (again, the Montreal show is a great example of this). Lyrically it’s a remarkably complex song, full of starkly dramatic imagery. A great deal has been made of interpreting Dylan’s symbolism (he does this himself during his 1963 interview with Studs Terkel, telling him that “pellets of poison” are the lies of the news media), which, as a professor of English literature I should probably endorse. But I don’t. I like the song’s images as images and have no desire to nail them down. And more to the point I love the way that Dylan wails “haaaard” on this one like a primal scream. Blowin’ in the Wind is the song that has the simplicity to speak to millions, but I prefer Hard Rain for its ability to show us Dylan in full-on poetic mode, channeling the symbolists. In time this tendency will overwhelm him, but in 1963 it was all so fresh and powerful.